Print and fill out the relevant forms. Bring them with you at your first appointment. The iliotibial band (ITB) is a long, flat and strong tendonous structure that originates from both the gluteus maximus and tensor facia lata (TFL) muscles at the hip and runs down the outside of the thigh. It inserts into the outer region of the shin bone just below the outside of the knee joint (formally called Gerdy’s tubercle of the lateral condyle of the tibia). Iliotibial band friction syndrome (also known as iliotibial band syndrome or ITBS) is the inflammation and painful irritation of the iliotibial band where it passes over the lateral epicondyle of the femur, an area just above the outside of the knee joint. 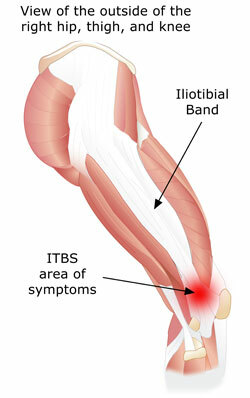 ITBS is typically the result of repetitive bending and straightening of the knee. It is commonly seen in long-distance runners that bend and straighten their knee hundreds to thousands of times during an endurance run. Cyclists may develop ITBS because of poor bike setup. ITBS has been reported in fast-growing teens as well. abnormal hip, knee, and/or foot mechanics (e.g. excessive pronation) during running. repetitive overuse (for example rapid increases in the number of miles run. poor hip muscle strength and/or endurance. improper bike fit for cyclists. According to recent clinical research, hip weakness does not appear to be a cause of ITBS in runners, but more studies are necessary. Hip weakness is common though in teens. Conservative treatment is recommended. A physical therapist will evaluate walking and running patterns (gait), bike fit, flexibility, strength, knee and foot mechanics. Treatment usually consists of patient education, rest, stretching, strengthening, a possible change of running shoes, and ice for acute episodes of inflammation. Copyright 2019 Progressive Physical Therapy, All Rights Reserved. Powered by E-Rehab.